CanberraUAV had one of those days yesterday. 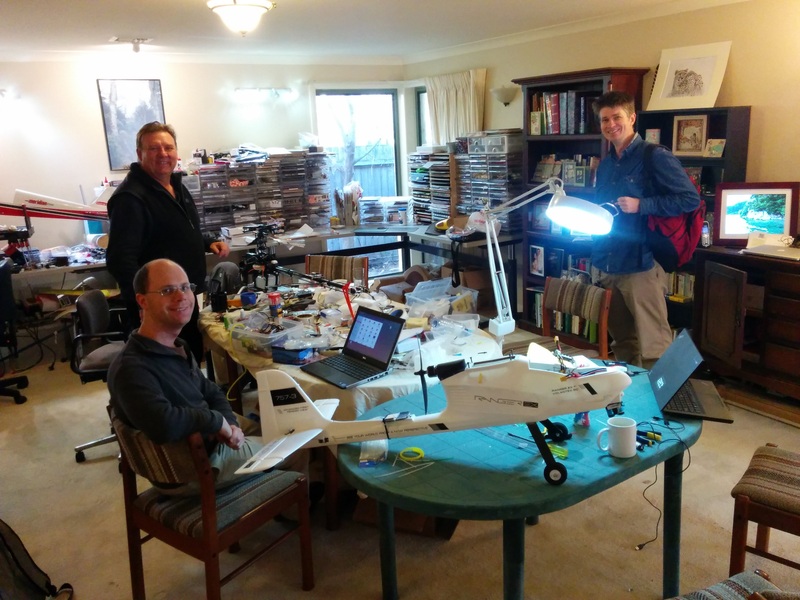 It was a wonderful sunny winters day at our local flying field and we were test flying our latest creations. First up was the "Vampire Mark 2", a combined plane quadcopter built by Jack Pittar. It consists of a senior telemaster with a 15cc petrol engine, but with the addition of 4 quadcopter motors. It was the maiden flight yesterday, and it was setup with a Pixhawk controlling the quad engines and the rest controlled manually as a normal RC model. We flew with two pilots (Justin Galbraith and Jack Pittar). 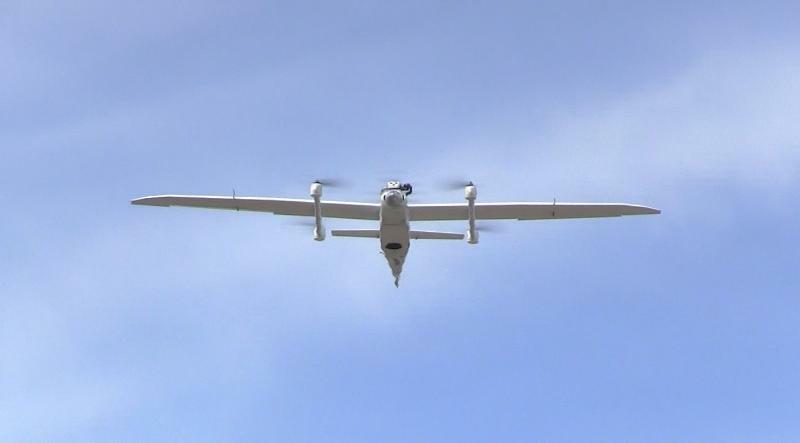 The takeoff was vertical as a quadcopter, and it then transitioned to fixed wing flight using the extremely simple method of advancing the throttle on the plane while lowering the throttle on the telemaster. Transition was very easy and the plane reached 31m/s in forward flight at full throttle. The landing transition was equally easy. Jack lowered the throttle on the plane while Justin raised the throttle on the quadcopter. No problems! Given this was the first flight of a highly experimental aircraft we were pretty pleased with the result! Jack is thinking of building an even bigger version soon that will be able to complete the 2016 OBC mission with plenty of room for equipment. Next up was our JS90 helicopter, originally built by Ryan Pope and adapted for autonomous flight. This is the flybar version of the JS90-v2 heli from Hobbyking, with a OS GT15HZ petrol engine fitted, along with a Pixhawk2 and a new "Blue Label" Lidar from pulsedlight. We've been flying (and crashing!) this heli for a while now, but yesterday was finally the day when we got to try high speed autonomous flight. apart from a small gap where we lost telemetry in the north west corner you can see the tracking in the auto mission was great. Once we learned how to tune a flybar heli (which turns out to be extremely simple!) it flies really well. We did have some issues getting it to fly as fast as we want. 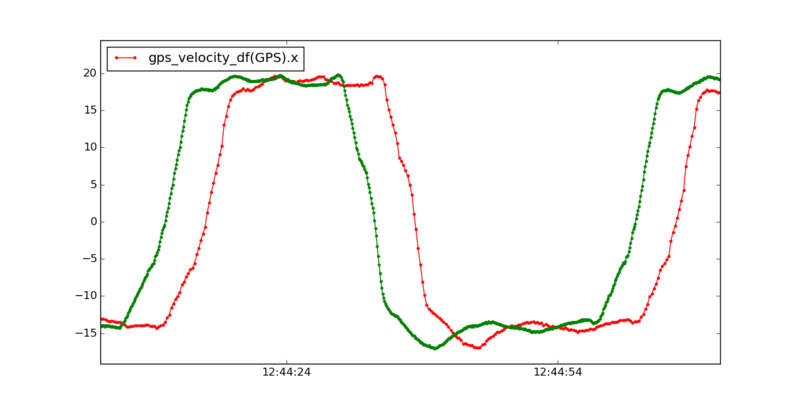 Above about 17m/s it occasionally pulled back and stopped for a second before continuing. We knew it could do more as it happily flew at over 27m/s in ALT_HOLD mode. With some help from Randy and a small code change to help with tuning we think we've tracked down the cause of that issue and expect to be doing 27m/s AUTO missions next weekend. Next up was another quad plane, this one quite different from the big telemaster build! We had been trying to track down a problem with loiter on the Parrot Bebop when running ArduPilot. 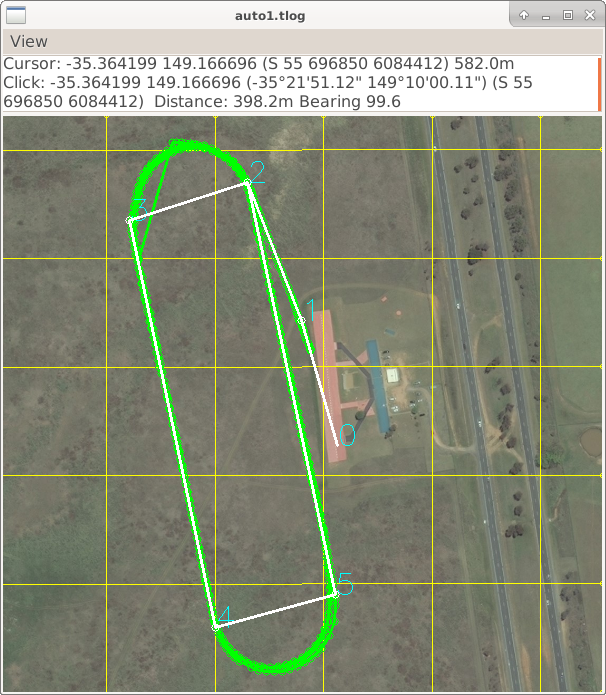 We suspected there may have been a GPS lag issue, so we wanted to get some flight data that would allow us to compare the performance of a uBlox GPS with the GPS in the Bebop for dynamic flight. We thought a good way to do that would be to strap the Bebop to a plane and take it for a fly. The results were very interesting! For this flight we saw a lag on the Bebop GPS of over 5 seconds, which must be some sort of buffering issue. We'll chat to Julien from Parrot to see if we can track down the issue. Next we thought it would be fun to see if something else could lift the tiny Bebop. Peter had his Solo there, so we strapped the Bebop to it and went for a fast fly in drift mode. Great fun! Overall it was a fantastic day! Next week we're really looking forward to trying the Trex700 petrol conversion that Greg has built which you can see in the background in this photo of our build day on Saturday. The build looks really good and we expect it to perform even better than the JS90, as Greg has managed to fit a Pixhawk while still being able to install the canopy. That should reduce drag quite a lot. The switch of focus for CanberraUAV to VTOL aircraft has been a lot of work, but the results are really paying off and we're having a lot of fun in the process. We hope that we'll have a lot more weekends like this one in the future. Top top banana and summer is coming! Did you get the props to stop fore and aft like the Arcturus jump 15 ? I'm in the right hemisphere, just could live a little closer. That's one club I would love to be part of, if only to make the tea and coffee. Its been a while since a telemaster has graced these pages! @Gary, we haven't done anything special with the quad props when stopped. 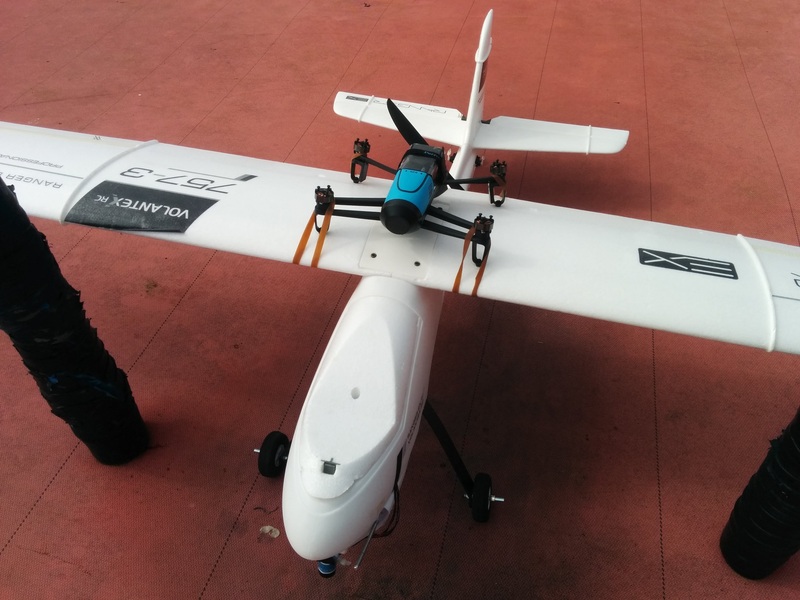 We would like to make them stop while pointing front-back, and perhaps we could do that with the newer UAVCAN ESCs. For now we were delighted to find that it didn't seem to matter for this plane. We did need to make a change to the copter code to prevent it auto disarming at zero throttle as we didn't like the idea of it flying about disarmed then rearming for landing (the EKF could have gotten quite confused, and it would be bad if it refused to arm again!). We've added a DISARM_DELAY parameter to master to make this easier for other people to try. Damn, I missed out big time. Although, no matter what we're doing, whether its the heli, a plane or anything in between, its always good fun on a Sunday morning at CMAC. I'm particularly interest in the gas power traDitional helicopter, looks like it is more practical than those huge quad copter. I wish your team will polish up the code and if possible share the build log so we can copy the set up. Looks like you're making progress on more than one front now! It's always a good feeling when everything just works! Just out of curiosity, how come all of the Heli's are still using flybars? I'll let Tridge answer why he's using flybars, but it should be clear that APM:Copter flies flybarless helis quite well. That is the primary development platform, and what the majority of users are flying. All my helis are flybarless. I have a gasser doing 25m/s in auto mode. I've had it faster before, but the way it's currently configured, it's a flying brick with very poor aerodynamics. Glad to hear you're having some good luck with the helicopter Tridge.